In a bold move that may affect terrorism trials across the nation, the prosecutor in the Winkie case plans to call skilled actors in place of those witnesses who cannot testify. With crimes that took place some years ago, for example, all of the witnesses against the defendant may in fact be dead. But that won’t stop this dynamo prosecutor, who has vowed to put freak of nature Winkie behind bars—and win himself a place in legal history. 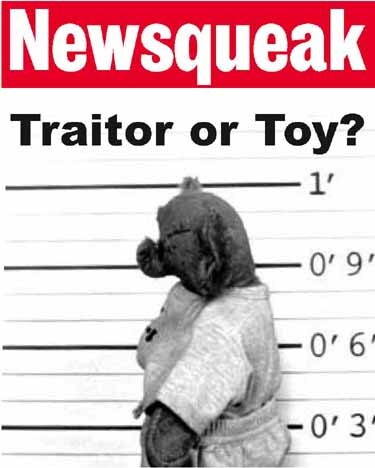 The point bears repeating: terrorist AND toy is also a possibility. the justice department source quoted in this news story has since repudiated his remarks and the story had to be retracted. said the source: "in characterizing some of the charges against winkie as 'falsehoods,' i must have confused this case with another one involving four government officials, a scottish golf course, seven transvestite hookers from glasgow and one unfortunate ewe." 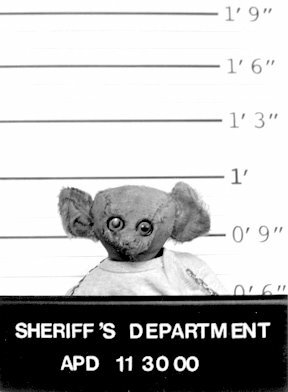 The question isn't necessarily whether Winkie committed certain crimes of antiquity, but if he ASPIRED to commit them. In the Salem of the Puritans, for example, plotting witchcraft was just as bad as doing it, and indeed therefore so is plotting now to do it back then. this is brilliant. actors as witness is the next step in reality programing -- reality reality. kind of like the actors recreating the michael jackson trial. While I ordinarily take the position that the guilt is in the ears, in Winkie's case it's clear that s/he is innocent. Winkie has the eyes of an innocent bear. The innocence is in the eyes. Eyes--even eyes that click--can't lie. Even if the sky blue caftan and small maroon fez fit, to paraphrase Johnnie Cochran, "You still must acquit."